That guy knew a very big secret to success and happiness. It isn’t just about talent or skill set, it more often is about persistence. This is true in every aspect of life. Have you ever heard something like ‘his overnight success took 10 years?’ It’s really bang on. There are so many examples of people who are successful who were not especially talented, educated or extra smart. They found success through persistence and dogged determination…not to mention a willingness to learn along the way. I know this is going to hurt some people’s sensitivities but sometimes things need to be said. This is so often the point where I see people struggling when they come to me and say that they can’t figure out why success eludes them. It’s really difficult to watch the disappointment and frustration on people’s faces when I point ou t this particular life lesson. Please take what I’m about to say with the love and care that is intended. The lesson here? Success rarely hits you on your first day out. You are foolish to think you can do everything in one shot simply because you made a plan or had a big desire. Okay but here’s the good news. You did find success…just perhaps not the one you were looking for. Just because you planned for one specific outcome, doesn’t mean it will work out somehow for the best. At the least, you’ve gained valuable insights, skills and learned more of that which you needed to know to do better next time. This is where persistence comes into play. You’ve got to keep going, adjusting the plan and perhaps even the goals. This is true all over the place. It’s true for business, career, relationships, healthy living, wellness…heck learning to ride a bike! You name it, if you give up because the first try didn’t work you’d still be stuck crawling around on all fours. 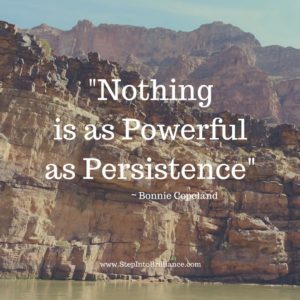 Nothing is as powerful as persistence. If you have passion for something you will be determined to persist. One of my favorite metaphors for persistence comes from the story of how a small stream can, over time wear away solid stone. At first glance of course a little water would seem unable to change the way that the hard stone looks. But through time, persistence and movement, it most certainly can. In fact the water’s movement shapes entire landscapes…all through persistence. Have you ever noticed a flower or bit of grass growing in a strange place? How about through rock? How do you suppose a fragile flower manages to fragment rock? You know…persistence. Keep this in mind next time you are feeling frustrated that success did not show up despite your sincere effort. And may you find the pleasure that comes from the lessons learned by simply pushing forth and staying determined. Every flower, every person will bloom when they are ready, but not before they do the work, stretch and push on to find a way to feel the warmth of the sun. PS: Do the clicky thing and come check out our Facebook Group. We’ve got FB lives, videos, inspiration and motivation every where you look!